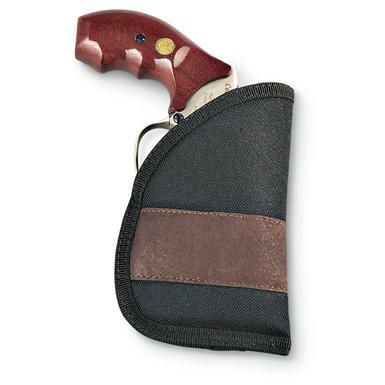 Python® Pocket Holster, a nifty little carry, SAVE! An easy concealed carry that works! Simplicity at its finest with nylon outer and non-marring padded upholstery on the inside. Suede strip "grabs" the pocket interior to keep it securely in. Fits small auto pistols and compact revolvers. Pocket this great buy right away! Please Note: Suede strip may vary in color. Sorry, no choice. Python Pocket Holster is rated 4.6 out of 5 by 37. Rated 5 out of 5 by D Bug from Excellent Holster For The NAA Black Widow. Fits very nice in the pocket. Rated 3 out of 5 by bikesnguns from Fair price Bought this for my 2" Taurus .357 revolver & my Kahr CW9. It looks to be a well made product but it fit my guns a little too loose for my liking and I'm going to send it back. However, it may work better for other firearms. Rated 5 out of 5 by keith from LOVE THIS AS A POCKET HOLSTER FOR A KELTEC Fits a small 380 just about perfect, breaks up the out line in your pocket. good product! Rated 5 out of 5 by W123 from Works great Works great in pants pocket as well as jacket pocket. Rated 5 out of 5 by Doc Stickel from Great value for the price. Appears to be durable, and accomodates my Glock 380 and S&W J frame perfectly. I'd buy it again. Rated 5 out of 5 by Benmark from Great holster This little holster holds my wifes Charter Arms revolver like the proverbial glove. Fits in her purse just great and is easy to find when needed.